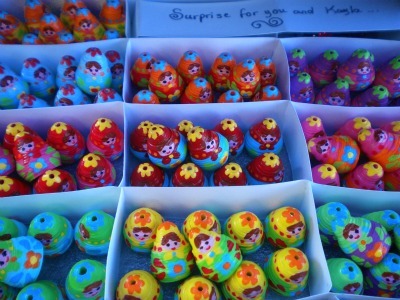 I would like to share with you, Manou’s paper bead Matryoshkas. I first saw these when we had the painted paper bead swap. Manou painstakingly painted each one of them and they are just super cute, don’t you think? 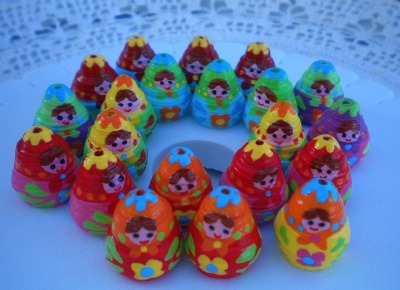 I think she first made cone beads with a wide base and painted each one to look like Matryoshka doll. Manou visits me regularly so you can ask her questions here about these cute paper bead creations. Here’s the challenge: How would you incorporate these cute paper bead dolls into your design? I need your comments, inputs and ideas! 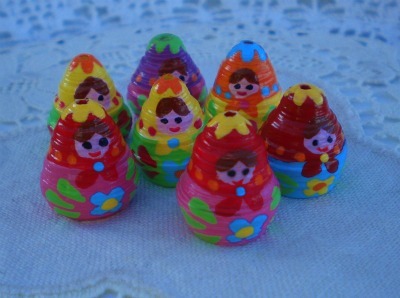 What I consider the best design idea will win a set (2) Matryoshka Paper Bead Dolls. Attached to pin, then line them up. It would make a great brooch. I am just learning about paper beads. I hope one day to be able to do something as beautiful as these. fantastic! i really would want to have one,just one. . . for a pendant! I love those beads! They are so adorable and cute! If I could only paint that well! I would make some cute dangly earrings out of them, adding a little crystal on top and I’d probably have to hide them from my daughter, I’m sure she’d love to wear them too. Those are adorable. I can’t believe the detail. Nice work, Manou. i think of a bracelet made from a chain, with matrioshka paper beads dangling like charms…simple but pretty and you could see well those cuties !